It happened silently, and we lost almost everything – our RAID 5 storage array crashed! No, I’m not talking about someone else, I’m talking today about our RAID 5 array at home, why it failed, and why I failed! A RAID 5 array is the cheapest solution if you want to have redundancy: it “costs” you just one disk as overhead where the storage controller writes parity information. With this parity information the storage controller is able to recreate the data on a disk when *one* disk crashes. The following picture illustrates this concept. I immediately panicked! Not active??? When you lose one disk in a RAID 5 array, the volume should go into the Degraded Mode. But offline? What the f… happend here? Next I checked the QNAP storage logs. According to the log the 2nd drive was kicked out of the RAID 5 volume several weeks ago, when we had a power outage. In addition to the degraded mode we had I/O errors on the 3rd drive. Boom! The RAID 5 volume was gone. And our oldest backup was several months old! The RAID 5 volume was not available anymore, and the oldest backup (onsite and cloud) was several months old. How do we get back the last 6 months of data? The QNAP itself is based on Linux. I have no idea about Linux, so I was immediately out of luck and knowledge. Therefore I opened a support case at QNAP. In the mean time I had already ordered a few additional 2 TB disks, so that I could replace the faulty disks. After a day I got a response from QNAP, and a support engineer logged into our QNAP through a Team Viewer session. He checked the status of the various drives through a SSH session. The outcome was that the 3rd drive was completely dead, and it seemed that the 2nd drive had “some” corrupt sectors. In the first step we replaced the 3rd drive with a spare volume that I already got in the meantime (this was an express shipment…). And finally the support engineer did some fancy magic through the SSH session and was able to bring the 2nd drive with the corrupt sectors online as well. And there it was: our RAID 5 array was back in the degraded mode, and started the resynchronization! The sychronization took around 24 hours, and afterwards I immediately backed up all the data that was missing in our 2 other backups. In sum we have lost a few files and changes to files because of the corrupt sectors on the 2nd drive. But we were able to recover almost all of our data! There are so many lessons learned from this storage crash, which can be also applied to SQL Server installations. Let’s talk about them in more detail. *FORGET* about RAID 5!!! As soon as *one* disk dies, you are in the degraded mode, and one additional disk failure brings your RAID 5 volume down! I would have never ever expected that 2 drives would fail within a few weeks. 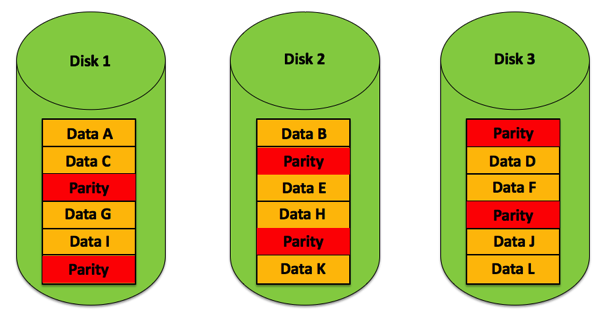 Our new storage configuration is now based on a RAID 10 volume (with 4x 4 TB drives), which gives us 8 TB of storage space, and 2 drives can fail without any problems – as long as they are not from the same mirror pair! *NEVER EVER* buy all your disks from one single shop! As you have seen from this story, 2 drives crashed within 3 weeks! When one disk crashed, there is also a very good chance that the other disks (from the same shipment) also have problems. Therefore I have now bought the 4 individual drives from *4* different shops – maybe I’m a little bit paranoid now, but I don’t want to take this risk again. You need alerts! The QNAP storage told us that we were in the degraded mode, but we didn’t listen. Therefore it is also very important that you configure your alerts accordingly. And the same applies to your SQL Server installation: it doesn’t help you at all if you regularly run database consistency checks but nobody takes any notice of the output of those jobs. You have to configure your alerts accordingly so that SQL Server tells you actively when there are problems like I/O errors, etc. We had a huge amount of luck, and our data loss was quite small. In conclusion we have now reconfigured the QNAP storage to a RAID 10 volume and I use disks from different shops just to be sure (as far as I can) that the disks do not crash at the same point in time again. And please make backups regularly (which you also test with a restore! ), and configure your alerts accordingly!